I don’t really know how it is that I lived to be this old and had not discovered Baileys until just last year. Sheltered much?! Oh my gosh I’ve been missing out. It is my winter splurge and so far, luckily, my willpower has made it possible that it is only in the house in the winter. Otherwise I’d have to be in the gym nonstop just to keep up with the fat content in my drink of choice. With the season almost over I knew I had to find a way to use it up before winter turns to spring. I had read a recipe for Irish Cream Cheesecake in a cookbook we have and decided the filling was the perfect thing for a tiny dessert. You know, the kind you can have well after dinner just to get a taste of something sweet. I skipped the springform pan, skipped the chocolate chip cookie crumble crust and just put the filling right into little dessert cups. Perfect size and not too much guilt. This is a no bake cheesecake so when I say simple, I am not kidding. You just mix it, cool it and eat it. Ahhh! My kind of dessert for a busy Saturday when play dough has taken over the kitchen and snowsuits are scattered all over the place. Start by melting the chocolate in a heat proof bowl set atop a pan simmering with water. Once melted let it cool completely. Lightly whip the cream and put aside. Mix the cream cheese and the sugar until smooth and silky. This is where you really need to be sure you are working with room temperature cream cheese. Otherwise you will get lumpy filling. Once the cream cheese and sugar are mixed fold in the cream and then the chocolate. 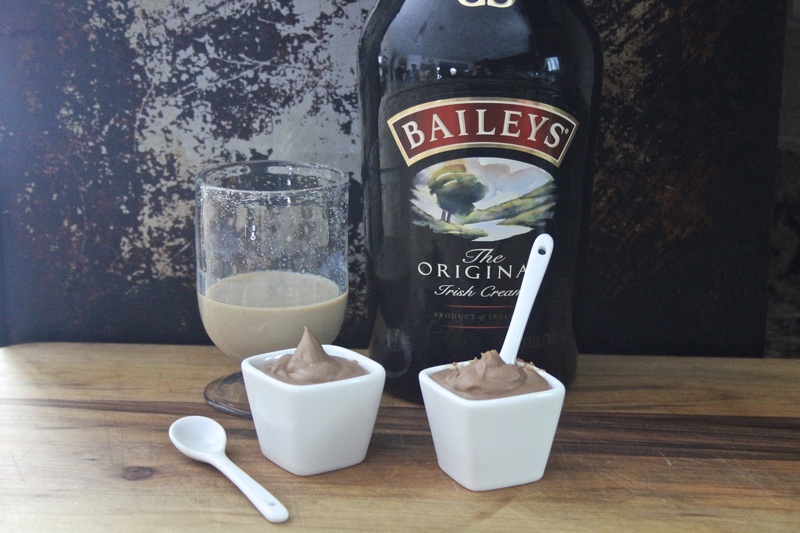 Stir in the Baileys and spoon into small dessert cups. Place in the fridge for two to three hours so the mixture can set. The end result is decadent and chocolatey with just a hint of Baileys. The tiny cups give you just a few bites- a great way to end the night. Now if someone could just come scrape the play dough bits out of our grout….